The new Mulberry Learning Center in Kuraburi is now open! 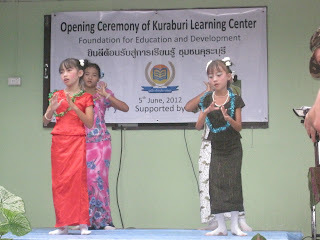 In June 2012 Andaman Discoveries, The Foundation for Education and Development and Mulberry Communications were proud to open the new learning center for the Burmese community in Kuraburi! AD has been working with this group of Burmese migrant children since 2009 through its volunteer program. Interested travelers can work with the school for periods of one week, up to one month. Volunteers conduct lessons in English, helping the teachers to learn new methods of teaching a foreign language, to keep the students active and engaged. The volunteers also introduce activities or special hobbies and interests and work with the children in a friendly and loving way. This offers the children interaction with foreigners that they may never be able to have otherwise, and an opportunity to develop communication skills that could be beneficial in future employment. Since the initial set up of the volunteering program, AD has sent over 35 volunteers to the school, to share with the children skills in art and crafts, music and English language. In 2011 both AD and FED recognized a dire need for a new location for the learning center, as the conditions at the school by pier had degraded substantially. During rainy season water would flood the classrooms, bringing water up to knee level of the children. Sewage and waste water running behind the school posed health hazards to the students and teachers. These conditions made for an unsuitable learning environment and would cause cancellation of class for days at a time. Andaman Discoveries began to use its extensive network to find sources of funding to help the learning center. Through its working relationship with Planeterra, a non-profit subsidiary of the tour provider G-adventures, the two were able to secure funding from, Mulberry Marketing Communications, for the construction of a new school. AD was also able to receive funding for the purchase of land from a private donor so the school could be moved from the pier to a nice field that was once a palm oil tree farm. The new area and building would provide the perfect place for these children to receive a quality education. In June of 2012, the construction was completed and the school was proud to be opened as the new Mulberry Learning Center. The new building has capacity to provide education for up to two hundred students, offering classes according to the Burmese curriculum as well as lessons in Thai and English language. A new playground offers the children a safe and healthy environment for play and exercise. The completion of a small room for computers will be able to offer these children an opportunity to learn skills that are requirements for most employment in this technological time. Future plans include an organic garden to provide healthy vegetables and fruits for the school. Even with all of the accomplishments earned over the last year, the Mulberry Learning Center is still in need of additional funding to cover basic expenses like teachers’ salaries, a proper kitchen structure and lunch programs. Andaman Discoveries continues to actively seek funding to assists this project for success in the future, so it can continue to provide a quality education and opportunity to this special community in a sustainable and successful way. If you would like to make a donation please contact info@andamandiscoveries.com. Thank you!